Next Thursday 19th July I will be showing a selection of my netsuke mini woodblock prints at North Art Gallery, Bristol. The Summer Show Preview will be from 6pm - 9pm. Other artists exhibiting their work include: Miche Watkins, Tina Altwegg, Gareth Pitt, Sarah V Penrose, Ian Pillidge, Jane Warring, Jess Stevenson, David Brown, Tony Eastman, Victoria Fox, Ian Usher, Caroline McGlone, Lenny, Andrew Wilson and Luz Gallardo-Franco. Netsuke - Elephant and Man in the Form of a Seal. Woodblock print. Through my exploration of woodblock printing inspired by Japanese antique netsuke I have discovered many beautifully carved creatures in museum collections, catalogues, books, exhibitions and from friends who have had netsuke passed down to them through family. I have also encountered a deep sadness and uncertainty throughout this process. As humans our love for aesthetics and beauty throughout time has come at a great cost to other living beings. If the desire to make stuff is "our shared human inheritance” (Elizabeth Gilbert) I wonder if we can begin to learn new ways of using our ‘gifts' to connect in a more harmonious way with the environment and our fellow creatures on the planet. Ivory has been, and continues to be, one of the main materials used for carving netsuke. Elephants are poached for their tusks in order for humans to maintain trade relations, causing extreme suffering of this rare and beautiful species. A few weeks ago I went along to the UWE degree show at Bower Ashton Campus in Bristol. I was so moved by this short film that I wanted to share it here. Impossible Dream was written, produced and directed by Alice Owen based in the Southwest of England. Daniel Zuma lives in the Tsavo corridor in Maungu Village, Kenya. His dream was initially to become a pilot flying commercial airplanes until he met Rob Dodson from Wildlife Works. Rob, a gyrocopter pilot in charge of a wildlife arial surveillance team, took Daniel under his wing giving him the opportunity to understand the importance of wildlife and study a diploma in aeronautical engineering. Daniel’s dream is now to become a Bush pilot helping to reduce conflict and conserve wildlife every day. Another screening of ‘Impossible Dream’ will take place at UWE in the Autumn. Dates not confirmed yet but to find out more or to connect with Alice Owen click on the link below. If you want to help the elephants by purchasing one of my netsuke prints, I give a donation of £5 to Save The Elephants for each print sold. Over the last few weeks I have been working with some fab spirited teens at a community centre in Salisbury. For the latest linocut workshop I brought along some celebrities. Ed Sheeran and Camilla Cabeo were the favourites. The teens got stuck in and made some brilliant prints. Here’s a snapshot of their hard work! Team effort is involved in the creation of Ed Sheeran. Together they carve and roll out the ink while one holds the paper the other prints. A wonderful collaborative process. A very focused and reflective individual enjoys the independence of carving and printing Camila Cabeo by herself. The Rock created with an abundance of animated energy shows in these boldly carved lines. Celebrities pop art pics are left to one side for she already has something in mind. 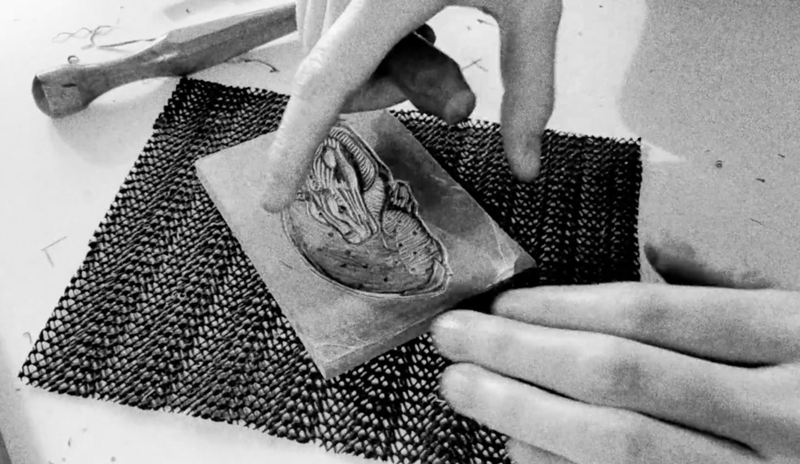 Usually to print text from a lino block, the text needs to be carved back-to-front. This way the text will print the right way round. But today a different approach is needed in order for a thoughtful teen to give the actual lino as a gift to a friend. 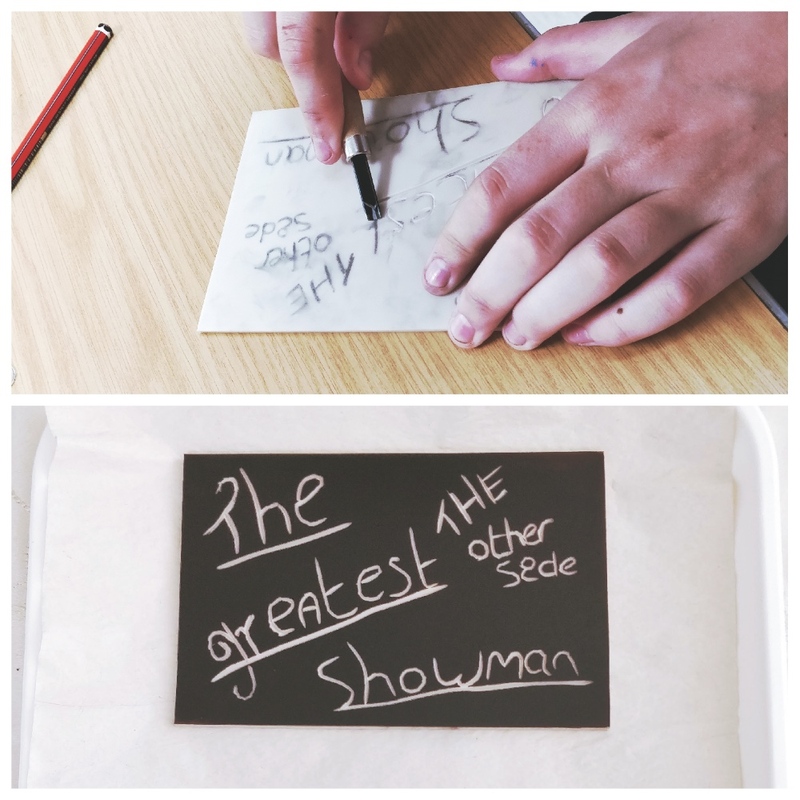 She carves the words directly into the lino the right way round and inks up the lino to reveal the carved letters. The ink is left on the lino to dry. Thank you to all the teens for your openess to explore printmaking and your commitment and effort throughout the whole process. 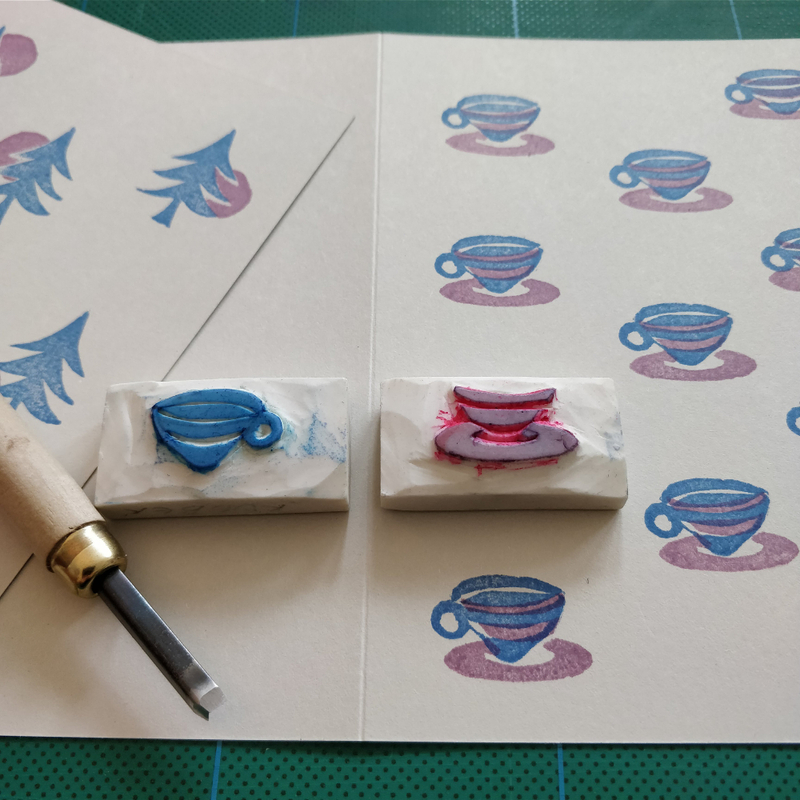 Eightfivepress delivers rubber-stamp, linocut and letterpress printing workshops. If you would like to book Mog for a printmaking workshop at your community centre or school please click on the link below. Recently I made a print of a deer. In my last post I showed a brief glimpse of the process through images and talked about the inspiration behind the print. What I forgot to mention was that before I started carving the woodblock, I set up my tripod and mobile phone, and recorded the process. So here's a short film (speeded up into 7 mins) following the process of carving the woodblock from start to finish accompanied by music and a poem by John Drinkwater. I am aware that we are bombarded with SO much information these days and 7 minutes of carving a piece of wood may just be too painfully long to endure, but I like to think it might be worth ‘carving' out a little piece of time to watch this film for seven moments of tranquility. The date for this workshop will be moved to a later date in May. I will keep you posted! An Enyclopedia of Inspiration coming soon!